PROVIDING DISCOUNT TYRES TO NEWCASTLE FOR OVER 4 YEARS! Broadmeadow Tyres & Service not only does tyres but can take care of your car from Logbook Servicing, Mechanical Repairs, Suspension Repairs, Brakes, Air Con Repairs, Wheel Alignment and Windscreen Repair/Replacement. The friendly and experienced team at Broadmeadow Tyres and Service have been servicing the Newcastle area and surrounds for 3 years now. 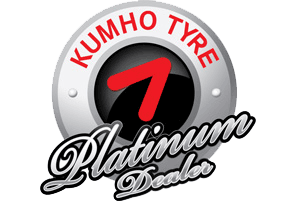 With a reputation for going above and beyond for our customers, we are proud to have been awarded the Kumho Platinum Dealer status. Our store is located at 4 Newton Street. We use respected tyre brands which cater to all budgets, to ensure that your vehicle’s driving needs are met. Broadmeadow Tyres and Service is proud to partner with Kumho Platinum, and our status ensures we can bring you the best prices on a massive range of Kumho Tyres. We’re your perfect choice for vehicle repairs and servicing. Our experienced staff can offer you professional advice on a range of services including wheel alignments, logbook servicing, suspension repairs and mechanical repairs. When your vehicle is due for a service, or in need of repair, contact Broadmeadow Tyres and Service on 02 4048 0108 or come in and see Kam and the rest of the team at 4 Newton Street to discuss your next service or to book in your vehicle.